I was taking care of a patient awhile ago, post-angio. Currently chest pain free, normal sinus, hemodynamically stable, a good outcome. 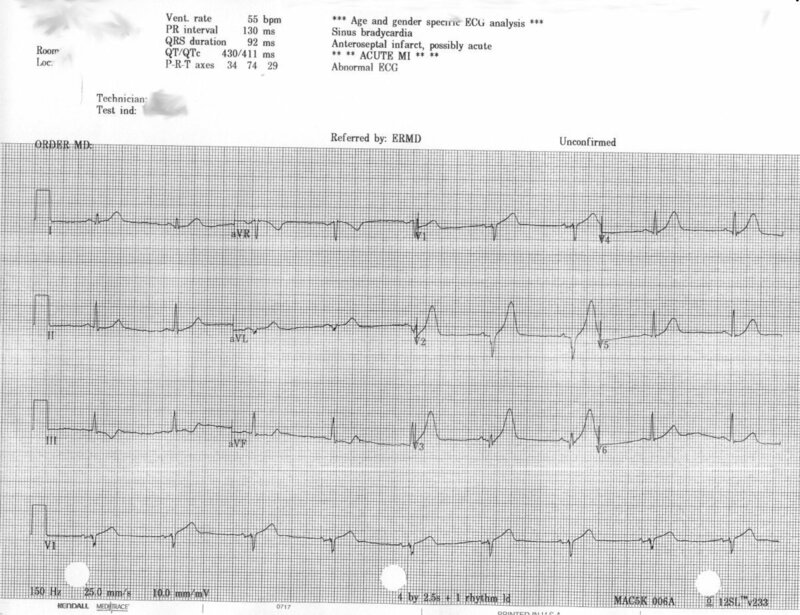 But then I took a look at the EKG they shot right after his trip to the cath lab. So what do we have? ST-elevation in V1-v4, and flipped T-waves in V5, V6, I and aVL. Looks nasty, like an anterolateral MI, right? Maybe some issues with the Left Anterior Descending and Left Circumflex arteries? Nope. According to the cath lab report, angiography showed several “hazy” luminal irregularities in the LAD, but nothing stentable. The patient was kept overnight for aggressive anticoagulation and initiation of statin therapy. So what’s the deal? It could be a couple of things. 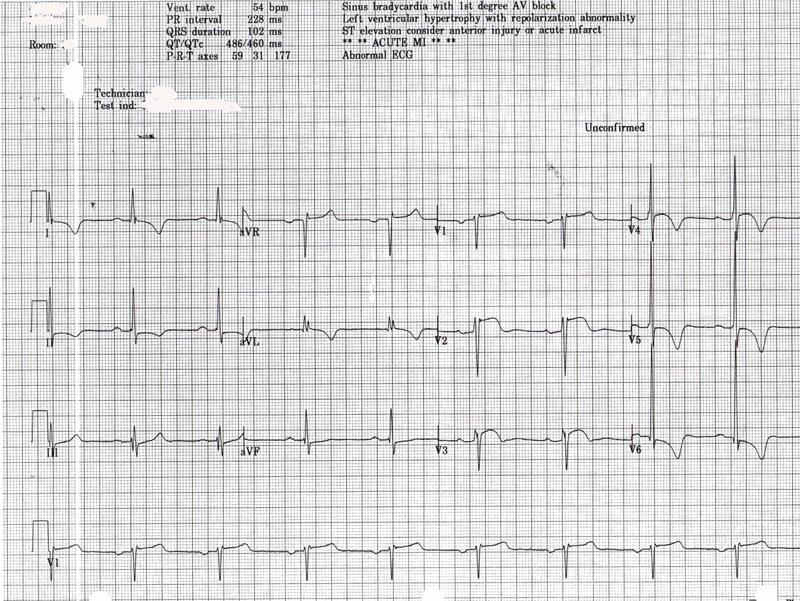 First, being a taller, young man, this could be a normal variant on his EKG, unfortunately there was no prior EKG to compare it to. Second, he could have had a vessel spasm causing acute ischemia, but this would be transient and as several EKGs done over a course of several hours showed this same view , it is not a transient phenomenon. Finally, this could be an example of microemboli showering from a plaque rupture into the distal circulation served by the LAD. Microembolic showering highlights some contentious issues in coronary artery disease, the issue of the large vessel versus small vessels. Too often the distal circulation is overlooked in favor of dealing with the larger supply vessels. We tend to focus on the big pipes, but where the real perfusion happens in the small distal arterioles that supply the myocardium. One reason is that why can’t adeuately visualize these small vessels. We can shoot all the dye we want and still see nothing. This also delves into the scene where the pipes are clear, but the patient is still experiencing chest pain: the distal portion is not getting enough blood. Looking at the tracing, one would expect to have either a complete blockage of at least one artery or a subtotal occlusion, not a minimal irregularity. Whether or not this gent dodged a bullet remains to be seen, but odds are they’ll be back. Unfortunately. *UPDATE* Thanks to great discussion and several well-informed comments I have learned a great deal. LVH? Sure thing. Not too suprising either considering the patient had a long-standing history of hypertension. A small caveat though: I’ve only been taught to identify basics on 12-leads, but I am learning. Things like his help me learn and increase my skills and knowledge, which is why I share these cases for discussion.